THE MOST LOVELY CARP OF ALL? I ADORE commons, - be they wildies, ferals or plump kings; but sometimes I wonder if I love fully-scaled mirrors just a little bit more? I caught them early on. When I was 13 or so, the Kidderminster and District Angling Association stocked the rural stretch of the Stourbridge Canal with 1,200 carp. They seemed to thrive, and some of them were fully-scaled affairs – absolutely gorgeous creatures, with a colour-range that simply took your breath away. I remember pinks and yellow tinges to the big plate scales, and tiny little white and yellow scales on their tummies. Being a teenager, I suppose I took them all for granted, at least a little. It wasn’t until the late nineties when I encountered such marvellous-looking carp again, and that was on the banks of Ashperton Moat. 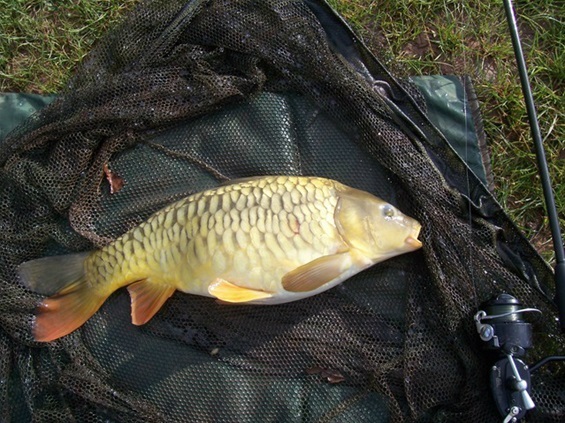 I caught five carp on my first session, and three were fully-scaled mirrors. I didn’t photograph a single one – and I didn’t weigh them either. They weren’t huge, - but when a lad came over to ask what they weighed, I couldn’t tell him, and he was surprised that I had slipped them all back so promptly. However, it was high summer and I expect I was concerned about the heat. In 2009, I managed a nice very heavily-plated mirror from the farm pond I call “Poplar Pool”, and a fellow angler, a complete stranger, did the honours with the camera to give me a decent fixed image of the day. Again, the heat was incredible – perhaps fully-scaled mirrors turn on more in the heat? I really don’t know. I do know that this was an attractive fish, despite a little scale and caudal damage due, I think, to over-enthusiastic spawning in the weeks prior to its capture. 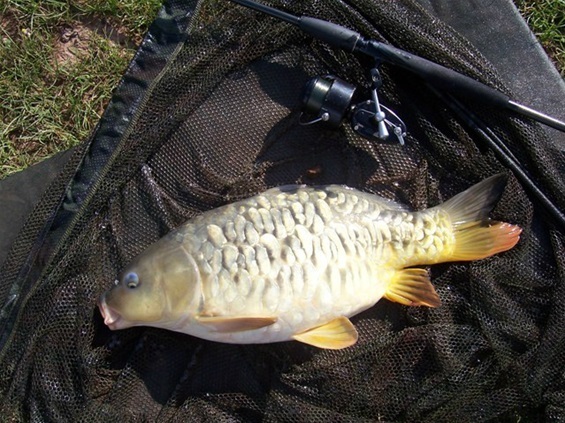 And it was still not my ideal carp, because it wasn’t quite a fully-scaled mirror carp. I was to encounter those beauties again at a farm reservoir I call “Wrong Goose Pool” – mainly because a flock of geese landed there while I was fishing, seemed to argue over some mistake, and then took off again, just as suddenly and as noisily as they had arrived! Once again, it was a day of astonishing heat, in 2011 – even though it was early October. This pool was very private, and it was strange to walk down a surfaced path in silence, while being aware that security cameras were probably watching my every step. I had permission, of course! There was a clinical silence to the site which disturbed me a little, and I was never to return. 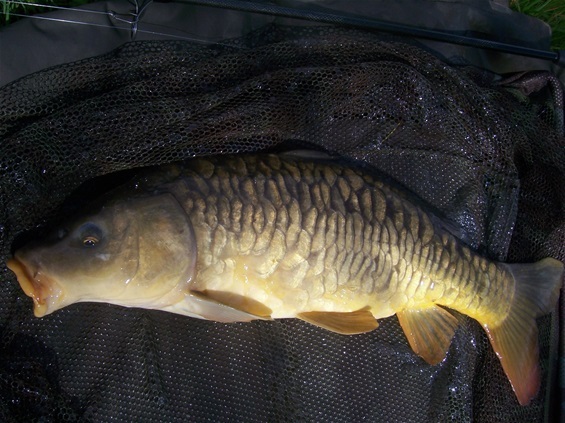 But there is no doubt that I encountered some marvellous-looking carp, perhaps the finest-looking carp I’ve ever seen. As I’ve already said, it was very hot day: and so my ‘theory’ about fully-scaled mirrors liking the heat might hold a little water. I ran out of fluids – I’d misjudged that heat, because it was October, and I almost staggered back up that track to the main lane because I was so thirsty and it is possible that I had mild sun-stroke too. But I think you’ll agree, these fish were really worth it. They weren’t huge, but my goodness, they were pretty! Picture above: A Wrong Goose Pool wonder, with scales of silver and platinum. A true "golden-scaler" from Wrong Goose Pool. A nice, 'near' fully-scaled mirror in the heat, from Poplar Pool. 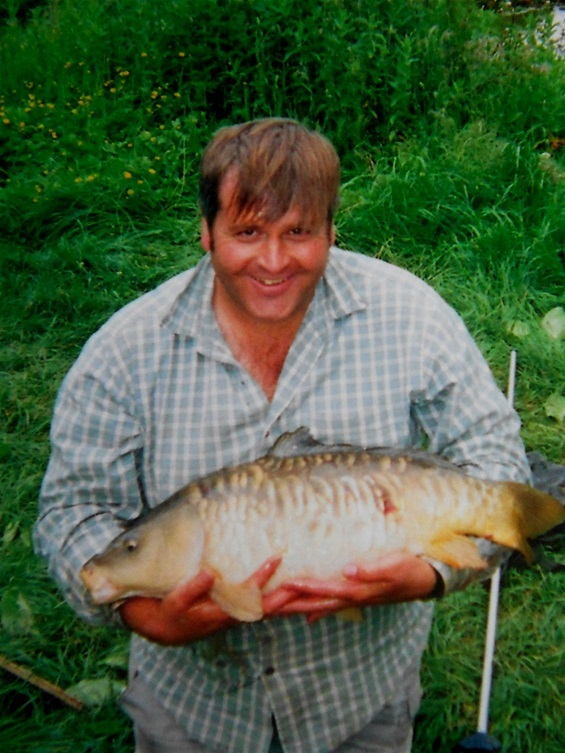 A fully-scaled mirror caught by The Gnome off "The Other Pool"